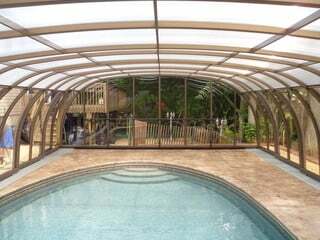 "I have been enjoying my pool and pool enclosure for about one year. It continues to be fantastic! My enclosure doubles as a greenhouse during the winter months. I had plants blooming all through the winter. I will post pictures of the plants at a later time. The plants included tropical angel trumpets (6 to 9 feet tall), roses, azaleas, and rhododendrons. During the winter, the temperature inside of the enclosure reached 80 and 90 degrees in full sun. At times it was so hot that I would have to open the door or a section of the enclosure to cool it down. This free heat was great during the winter for my plants and me. If the inside of my house was a bit cool, I could go outside to my enclosure, and be immediately wrapped in warmth. This was great in case I wanted to go outside and read a newspaper, eat something, or just relax. In this sense, the enclosure is an extension of my living space. It feels like my living room with a pool in the middle. I feel safe and secure, being totally surrounded with the enclosure, not to mention the beauty and functionality of it. Alex, and his company Pool and Spa Enclosures really elevated my standard of living, and I can't overstate the due recognition."